Home / Field Geeks / Baseball / MLB / NLW / Arizona Diamondbacks / Can The D-backs Keep Both Pollock & Corbin Even If They Wanted To? Can The D-backs Keep Both Pollock & Corbin Even If They Wanted To? This is the second part of a two part article. In the first article we looked at the positives and negatives of keeping both Patrick Corbin and A.J. Pollock past this season, which is there final season of their current contracts. The first article also looked at the stats of the two players and how much the two superstars would cost as compared to contracts signed by similar free agents last year. Now that we know the stats of each player and the approximate cost, the next question that we need to answer is; Do the Diamondbacks want to re-sign them both, and how exactly do they plan on doing that, if that is their desire? While keeping both Patrick and A.J. for next season and beyond may have the worst odds of the three – both stay; both leave; one stays, one leaves (highest odds I presume) – general manager Mike Hazen and company will likely have to find creative ways this off-season to create salary room for one or both players. Only 5 players will not be either a free agent, arbitration elig., or pre-arb eligible player at the end of the year. Via Baseball-reference. The most important things to note regarding next season is the second column that states there’s $62.4M wrapped up under contract for next season, the sixth row down, labeled “Arb costs”, and the next two rows (other players/costs). There are 13 arbitration eligible players (team and player submit a salary for that season. Arbitrator chooses one over the other) on the books for 2019, as well as seven pre-arbitration (more than likely league minimum pay) and seven free agents, two being Pollock and Corbin. Right off the bat, we’ll add the players’ contracts on the books for next season with the arbitration costs, $62.4M + $58.4M. That gives us a payroll of roughly $120M before the seven free agents. Of the seven, only A.J., Corbin and Descalso should be top priorities at this point. 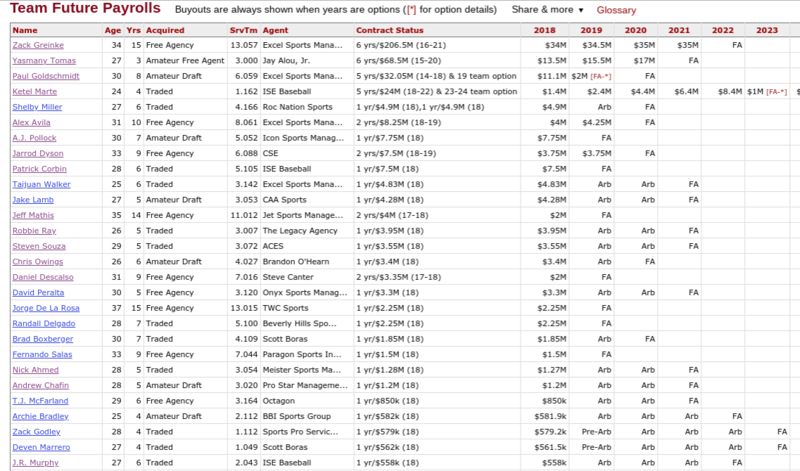 Figure about $3M if Descalso’s retained, bringing payroll up to $123(ish). Paul Goldschmidt has a $14M team option for next season. We’re at about a $137M total payroll now with 6 roster spots remaining. Add about $5M for the four other free agent signings, or controllable, cheap, minor league options that could be on the roster next season, bringing the payroll to about $142, before A.J. and Corbin. Baseball-reference has the total payroll for 2018 at about $130M, while Spotrac has the team right below $135, which both are still a few million short of the $139M league average. The division rival Rockies are currently at $143M. Considering the league average payroll should rise above $140M next season, it’s not too outlandish to think that the D’backs can bump their’s to above the league average and closer to the $145M-$150M next season. Teams between $140M-$156M for this season: Colorado (15th highest payroll), Texas (14th), Baltimore (13th) and Seatlle (12th). Adding Pollock and Corbin’s projected $31M to the already $142M that we have for next seasons payroll comes to an unrealistic $170M. So we’re going to find a couple of ways to add one or both players while staying at $150M or under. We’ll basically have to cut at least $23M from the books to make it work. A) The most obvious (and probably most likely scenario) is for the D’backs to eat $10M of Zack Greinke‘s $34M, and each year beyond, taking $24M of the projected $170M off the books. This is probably the most ideal situation. Braves and Phillies are both teams with good, young talent that have great promise this season. Both teams are well under the league average in payroll. Braves are at $120M ($19M under); Phillies are under $100M in team payroll. They seem likely trade partners. B) Another way to free up money would be eating around $5M-$6M of Yasmany Tomas‘ $15.5M for next season and another $6M(ish) off 2020’s $17M contract and ship him off to an American League team where said team would pay him about $10-$12M to be their designate hitter; similar to what Toronto’s DH Kendrys Morales and Baltimore’s DH Mark Trumbo are making. This option would still leave us with $10M+ more to cut to realistically have a chance at retaining both A.J. and Patrick, so if they were only able to trade Yasmany and do nothing else to cut salary drastically then it seems logical that only one could return. Can’t trade him while he’s wasting away in the minors though, so the Diamondbacks are going to need to bring him up at some point this season and play him sparingly, or start him and have a defensive replacement late in games to come in for him, so he can rebuild some value. Yasmany was a 30 HR guy in 2016 and has a positive offensive WAR in each of his three previous seasons at the big league level. 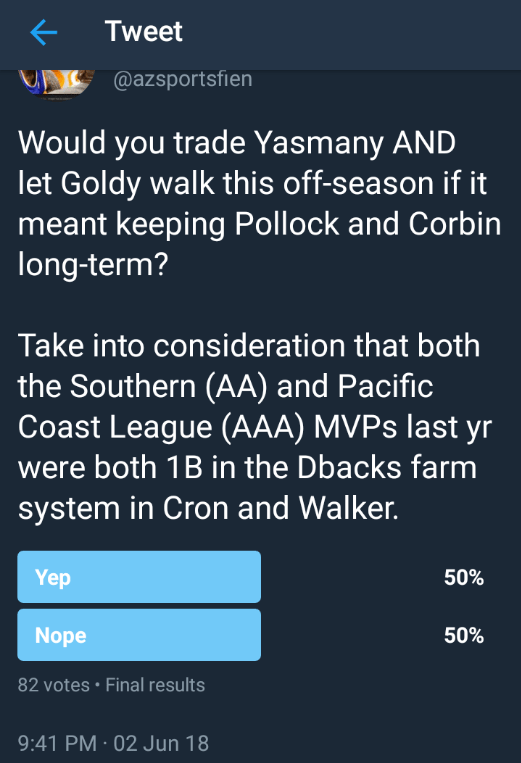 C) Sitting at around $128M before picking up Goldy’s $14M team option, the team could choose to not pick up and sign either A.J. or Corbin fairly easily. Reality is, Goldy will be 31 by the end of this season and will more than likely have his best days behind him as he enters free agency after next season at age 32. The D’backs could also take on that team option for Goldy and then trade him for a couple prospects or players under team control for the next couple years. The basic decline in offensive players over the years. This graph ends in 2013. The colors are the years. Green is most recent. 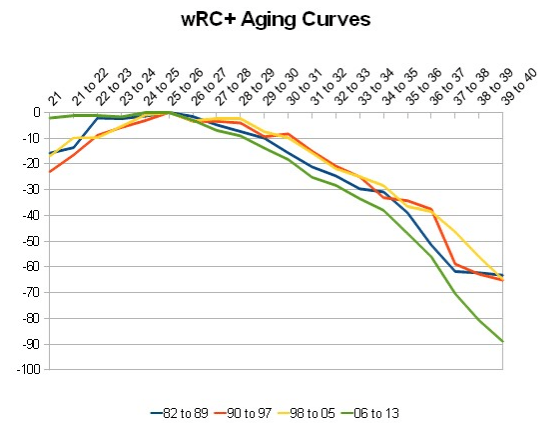 Via Fangraphs. Recent $100M contracts, prior to this previous off-season, given to players aged 30+. While he is a fan favorite, the Diamondbacks can’t afford to overpay for someone again like the previous regime did with Yasmany and Greinke ($50M between the two on the books for 2019). It’s not like the organization doesn’t have options at first base. It’s actually probably their biggest minor league strength with Christian Walker (PCL ’17 MVP Triple-A; HR once every 24 career at-bats; age 27), Kevin Cron (Southern League ’17 MVP Double-A; HR once and every 19.4 at-bats; age 25) and last seasons 1st round pick, Pavin Smith (won’t be MLB ready for another 2-3 seasons). If the team is able to shed at least another $10M due to trading Yasmany, on top of letting Goldy hit FA or trading him, the D’backs could fit the $32M that might be required to retain A.J. and Patrick under the $150M threshold, especially if they back load one or both contracts until Greinke’s $35M/year for the next three years is off the books. Sure it’s less than 1/1,000th of the fanbase, but still wasn’t expecting these results. Corbin and Pollock – both only behind Goldy on the team in seniority with the big club – had D’back fans everywhere worried, and still probably do, during the first month of action because both players’ production was going to seemingly price out the home team once contract negotiations came to a head this off-season unless something drastic happened, and yet it seems that possible regression to their norms and heady moves by the front office might actually make it more possible than most would’ve thought just only a month ago.